Are you looking for an easy dessert or sweet breakfast? 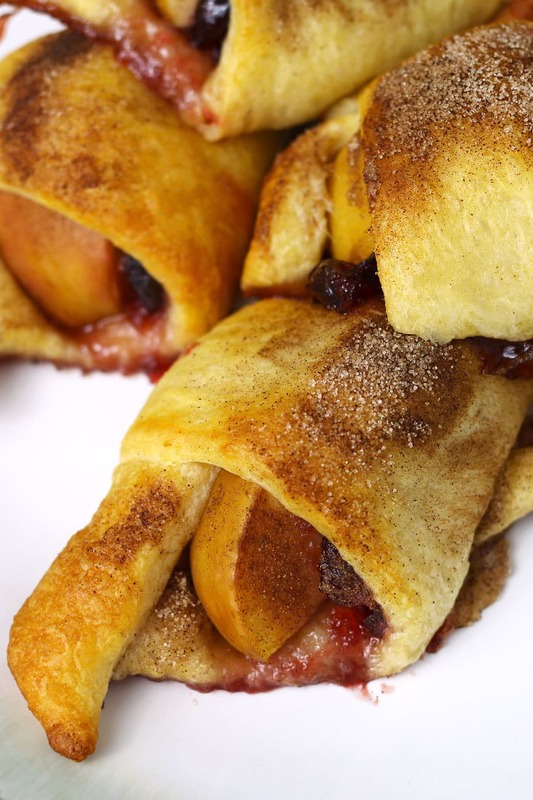 These apple cranberry crescent rolls are it. Place a pan of these rolls in the oven and when you pull it out, you will find a sweet treat that’s almost pie-like in it’s deliciousness. Also, do you have some leftover cranberry sauce hanging around? This is your answer. Place a dollop of cranberry sauce on top of each apple slice and you Thanksgiving leftover dilemna is solved. Open the tube of crescent rolls and separate into triangles. Place an apple slice near the wide part of the dough and top it with a dollop of cranberry sauce. Roll the dough into a crescent. Repeat with all of the dough triangles. Place on cookie sheet equally apart. In a small bowl, combine the sugar and cinnamon. Use your fingers to sprinkle the sugar mixture on top of the crescents. Place in oven and bake for 9-12 minutes, or until the crescents are golden. Remove from the oven and serve immediately. Place the cranberries in a small pot and cover with water until the cranberries are just submerged. Heat over medium-high heat. Bring to a boil, then add the brown sugar and maple syrup. Simmer for 20 minutes, or until the liquid has dissolved by half. Allow to cool slightly before using.